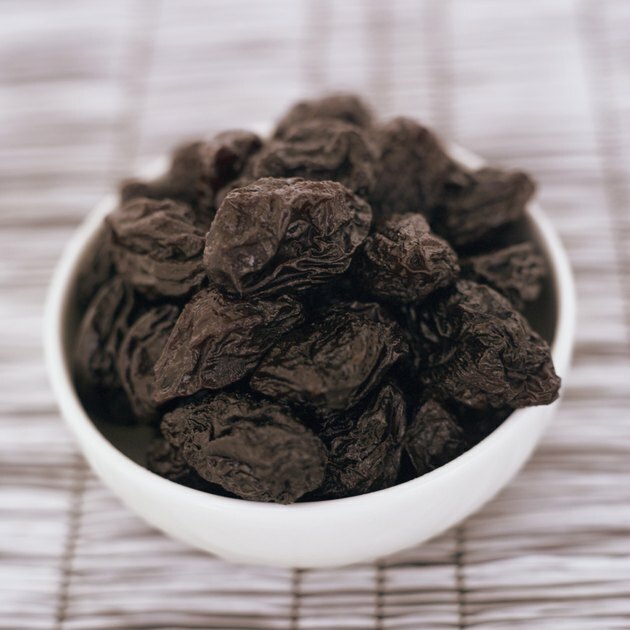 Although primarily praised for their mild laxative effects, prunes and prune juice also contain antioxidants to help fight disease-causing free radicals. While no official dosage exists, drinking prune juice daily may help prevent diseases such as heart disease and cancer as well as ease digestive problems. The antioxidant effects of the phenols in a small glass of prune juice may help lower levels of heart-damaging cholesterol. A study published in a 1998 edition of the “Journal of Agriculture and Food Chemistry” analyzed the effects of commercial prune and prune juice extracts on low-density lipoprotein, or LDL, cholesterol. Research findings determined that prunes and prune juice inhibited LDL oxidation to help lower levels of this “bad” cholesterol and potentially reduce the risk of heart disease. A small glass of sweet-tasting prune juice may help relieve symptoms of digestive distress. Prunes and prune juice contain a sugar alcohol called sorbitol, which metabolizes slowly, to aid in the proper digestion of foods. Prune juice may help alleviate irritable bowel syndrome symptoms as well as other bowel disorders, according to gastroenterologist Dr. Purushothaman Premchand. Indicators of poor digestive functioning include heartburn, stomach pain, different colored stools, constipation, diarrhea and fatigue. The juicing process removes insoluble fiber from prune juice, but leaves soluble fiber and sorbitol. Sorbitol may provide the mild laxative effect of prune juice to aid in the passage of stools. Chronic constipation may lead to serious health consequences. To reduce constipation, medical doctor and nutrition expert Ray Sahelian recommends drinking plenty of fluids, including a small glass of around 2 ounces of prune juice before bed and two glasses of cool water the next morning. What Are the Benefits of Coca Tea?